Many households successfully use foam sealants to control drafts. We turned to a sealant kit when we had a problem at the thrift shop. Fortunately for me, we didn't need a professional to use it. A staff member of mine used it the first time, I researched it for our van camper later. Each of the varieties that I looked at came with easy to follow instructions.The results were instantaneous. The nonprofit that I worked was housed in a 100 year old building. There were some bad air leaks around the doors and windows. It wasn't our building, so we didn't want to do any expensive repairs. A staff member used foam sealants in his camper and suggested them for our problems. It sounded good to me so I had him pick up a kit from the hardware store. His experience camper remodeling experience paid off. He had most of air leaks fixed in about an hour. The Dow spray sealant kit had easy instructions. You pretty much pointed the nozzle at the gap and sprayed. 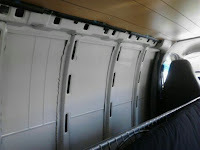 The foam expands to fill the space and forms an air tight seal that solved our problem. In May 2014, my husband and I bought a commercial panel van to turn into a campervan or small Class B RV. Travel for mission trips takes us to cooler and warmer climates, so adding insulation to the vehicle was a must. The ribs on the side of the van have deep pockets. I looked into foam sealants, but the "iffy" experience that another friend had turned me away from the product. He said he pulled the paneling about a year after using the foam to investigate some air drafts. That's when he found out that the top portion of the ribs were no longer insulated. The foam had released from the side of the van and slid down the inside. He had spent July in Phoenix and theorized that the heat built up enough to cause the product to release. That gave me pause. 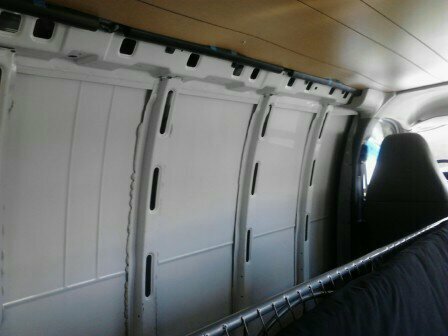 Given that we may take a summer mission trip to Arizona or Nevada, it seems better to go another route for van insulation. We might have gone with the foam sealant if we had a fifth-wheel or other type of RV. Otherwise, based on his experience, I would stick with using it at home instead of on the road.